Spring into Action – Red Hot Redfish, Trout and Flounder! One of the things that I love most about spring is the anticipation. For the most part winter can be a bit dreary, but as the azaleas begin to bloom and all of the critters come back out you can feel that things are changing. In my case it is time to get out fishing and that anticipation leaving the dock on a crisp spring morning really puts things into perspective. Some of the best fishing of the year occurs as the water starts to warm up and those lethargic winter fish become eating machines. This past year I was out with a buddy of mine poling a local flat and we just knew that we would get into em, everything was perfect…only no fish. “What can I say I thought this would be the day” I told my buddy Jason. As the morning came and went along with our hopes for a fish dinner we decided to fish one last grass point on our way out before the tide got too high. 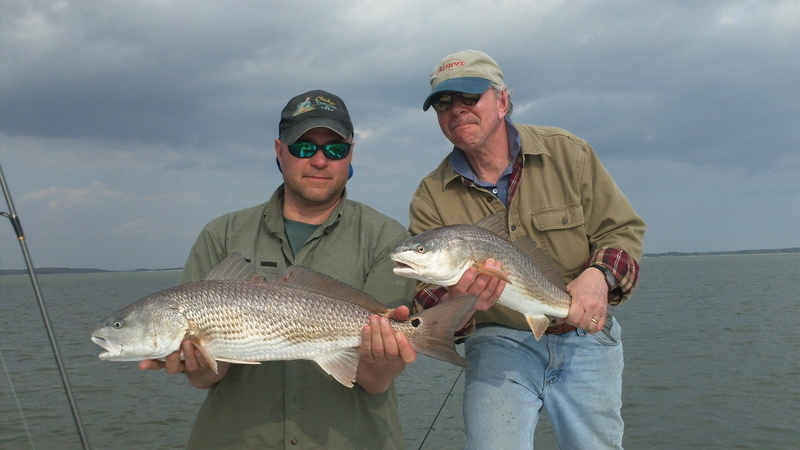 On our first pass we immediately hooked into a double header of nice redfish…then a fat sea trout, then more reds and then a flounder, then more trout and reds. Jason commented in the excitement “no wonder we haven’t caught any fish this morning, there all laying off of this point!”. I have to admit he was right, we sat there for over an hour wearing out fish and then as fast as it started it was over. Even if we had not caught those fish the day would have been a success, but they put the explanation point on Spring Fishing! To hear more tails of whoppers and mishaps give me a call and let’s put together a fishing trip and until then “catch em up”! This entry was posted on Sunday, April 15th, 2012 at 6:21 pm	and is filed under Fish Tails. You can follow any responses to this entry through the RSS 2.0 feed. You can leave a response, or trackback from your own site.